Sole-tek. 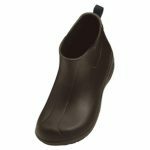 Holey’s slip-resistant thermo rubber sole for increased stability and durability. SmartCel, Holey’s unique formula memory foam which provides more comfort, improved support and resiliency. Built in arch and tarsal support. Massaging foot bed. Antimicrobial and odour resistant. Light weight and fully waterproof. Easy to take on and off. Assorted colours: black, sage.